Here is why I love the company, they are willing nip their problems at the bud and be proactive in solving customer issues. Like I said at the beginning of my post, people didn't like crackle polish, they complained about it, chose to skip, and so on. 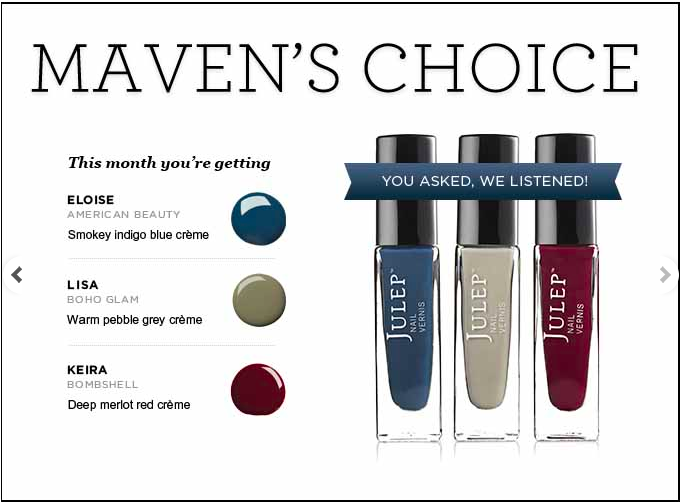 Within hours, "Maven's Choice" was available to all the crackle haters. 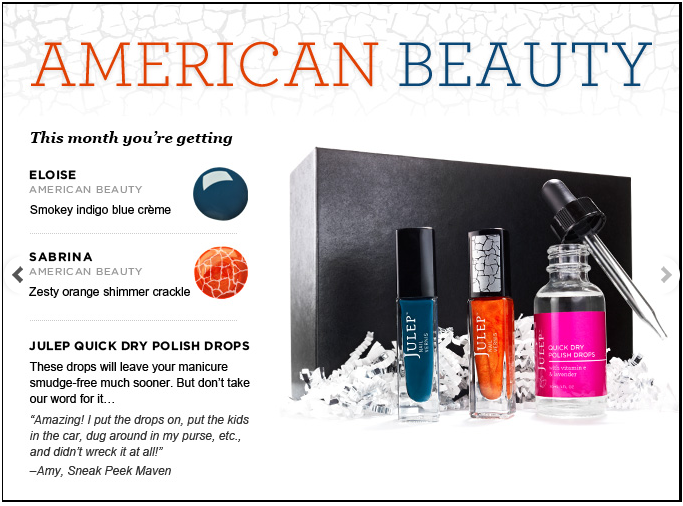 THANK YOU JULEP because I am definitely switching to this option! 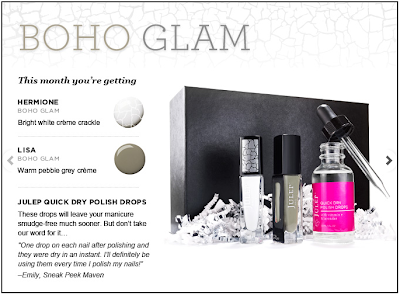 For my second box, I think I might go with Classic with a Twist just so I have a different polish for all the boxes and I get to try out the polish drop. 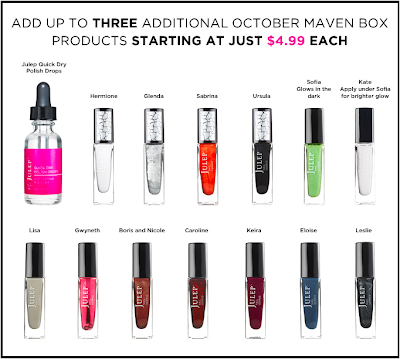 For all the indecisive people in love with this collection, everything is available for an additional $30. It's nice option to have but a little too expensive for me despite it still being a good deal. For now, I am depending on gaining boxes through referral and loving each and every one of you who buys through it! Also, as always you add additional items for $4.99! 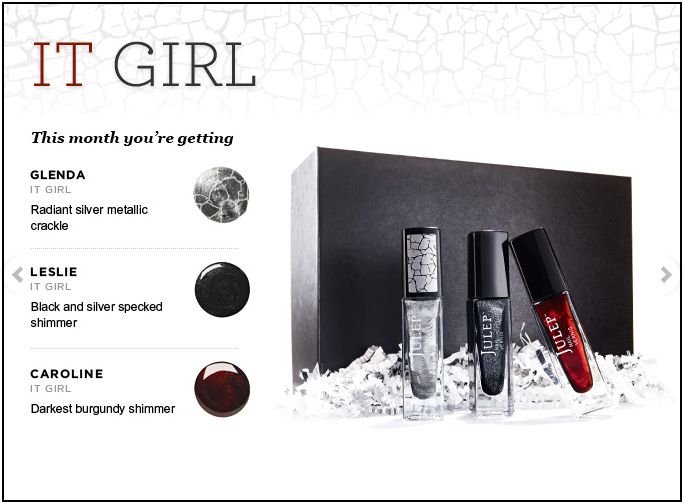 Anyways, which style are you going with this month? I know that this is an excruciatingly long post, so far now all I have to say for my September Julep Maven packages is that I love it. I adore the magnets that they gave us and I wish I had all 5 of them! The mascara was a nice featured product, and I like that it's a plastic wand so it can get between each lash. The polishes have great consistency and coverage as always. I really wanted to write a review post with my own Trina Turk inspired nail art (not like the Julep tutorials) but with a nailartcouture twist to it. Perhaps I will save it for the future. Anyways if you're interested in checking out Julep Maven, I'm helping future Dr. Cousin build her referral. Please spread the love her way! I think my mom and I has gained more than enough, so thank you again! i'm SO glad julep included the maven's choice option because none of the other ones were really appealing to me. 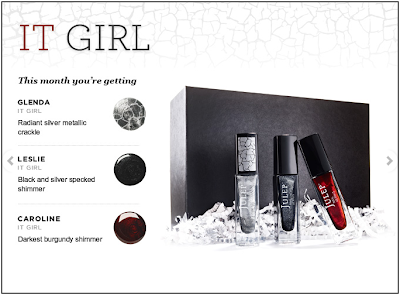 i definitely opted for that one and i'm looking forward to trying all three colours!